What will first come up to your mind when you heard about “FinTech”? Blockchain, digital currency or mobile banking…Do you know exactly what they are and how they impact your daily life or business? 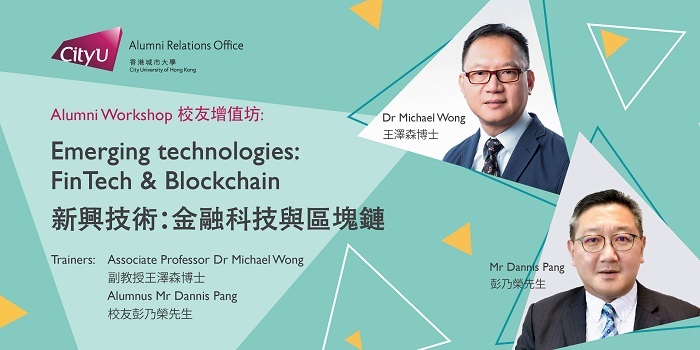 Find out more at alumni workshop and meet CityU Associate Professor of Finance, Dr Michael Wong (王澤森博士) and MSc Banking alumnus Mr Dannis Pang (彭乃榮先生), Business Development Executive of IBM. They will illustrate the concepts of FinTech and Blockchain, as well as their regulations and applications in an easy-to-understand way. Register now! Remark: The Organiser reserves the right to reschedule the captioned event.